Have you found yourself asking indica or sativa? Which one do I get? What’s the difference? Weed is weed, right? Not quite. Each plant has a different set of characteristics and effects, understanding the difference between the two will help you find that perfect strain. Many users report that the flower of sativa and indica cannabis plants each have their own distinct effects on the mind and body; sativas tend to give you a more energizing experience, while indicas tend to make you more relaxed. While these broad classifications do have some validity, this is not entirely correct. The words “sativa” and “indica” refer to the physical and geographic characteristics of the cannabis plant, rather than the effects the flower provides. In this post we will explore what makes a cannabis plant an indica or a sativa, and what is actually making you fall in love with a certain strain. Cannabis sativa was discovered by Western society before indica, and was thought to be the only species of cannabis. Sativa originates from areas between the 0° and 30° latitudes specifically Mexico, Columbia, Thailand and Southeast Asia. Because of the warmer temperature in these regions, cannabis sativa evolved to be tall and lanky to conserve water. Sativa plants can now be found all over the world, but tend to grow in warmer environments that mimic their original home. In 1785 Western explorers encountered the cannabis indica plant and named the plant after the location the plants were found – India. Cannabis indica evolved in the Kush Mountains of northern India and grew in the 30° and 50° latitudes. Like sativa, indica can now be found in most corners of the world. Indica plants tend to grow to about 3-6 feet tall and are ideal for growing indoors. The flowering time for indica is much faster than sativa at 6-8 weeks, making it a more popular plant among hobby growers. 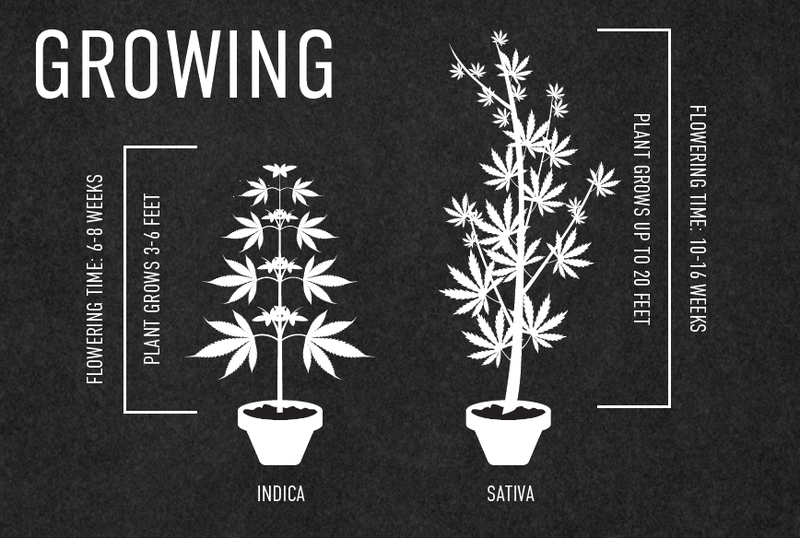 Sativa plants can grow up to 20 feet tall. Many growers like to mix the plants, creating hybrids to tame the height. They are also the longest flowering species, taking 10-16 weeks to flower. You can easily tell the difference between indica and sativa by the shape of their leaves. Indica leaves are deep in color and broad, while sativa leaves are lighter in color with slender leaves. As we mentioned above, many users associate indicas and sativas with their own unique effects. The classic school of thought is that indicas tends to be more relaxing and used at night, while sativas are energizing and are usually recommended for daytime use. The reason why a strain makes you feel a certain way, however, has more to do with the strain’s terpene profile than its indica or sativa classification. Terpenes are botanical compounds that are found in everything from pepper to lavender to hops. Terpenes are the reason why lavender is soothing, why spicy scents can wake you up, and why that IPA beer that’s full of hops makes you sleepy. The same principles apply to cannabis! You can check out our blog post on terpenes to learn more on this subject. Next time you’re shopping for cannabis don’t fall into the indica or sativa trap. Try something new! Tell your budtender why you want to use cannabis, and then ask what terpene profile would be best for your desired effects. You might just find your new favorite strain! 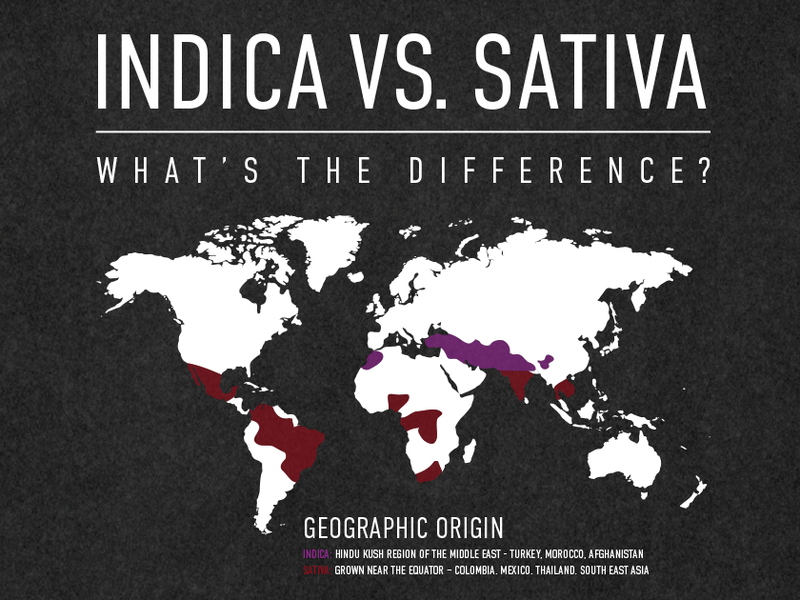 Download the Indica Vs. Sativa poster here. Are you conscientious of what you are purchasing? Is the cannabis you’re buying organic and sustainable? To be sure, verify that the cannabis you are buying is from a Clean Green Certified source. What does that mean? Legally, cannabis can not be called organic – the term organic is a federally regulated term and the USDA does not recognize cannabis as an agricultural crop. For this reason, the Clean Green Certified program was formed as a way to regulate legal cannabis products that call themselves organic. No matter how environmentally friendly the cultivation practices are to grow the cannabis, it is the only way to know your cannabis was grown using organic methods and handled in a clean and sustainable environment. The Clean Green Certified program is based off existing national and international agricultural standards that ensure environmentally clean and sustainable methods. A Clean Green Certified farm/facility must follow legal and responsible business practices. The farm/facility must follow Clean Green Certified standards, which incorporate Federal and State food handling guidelines. All certified farmers are issued a singular certification number and certificate, that can be verified at cleangreencertified.com. In order to keep Clean Green cannabis clean, it is critical to keep it seperate from conventionally-grown cannabis. Facilities must follow proper hygiene regulations, use airtight packaging and use no toxic chemicals in the facility handling areas. 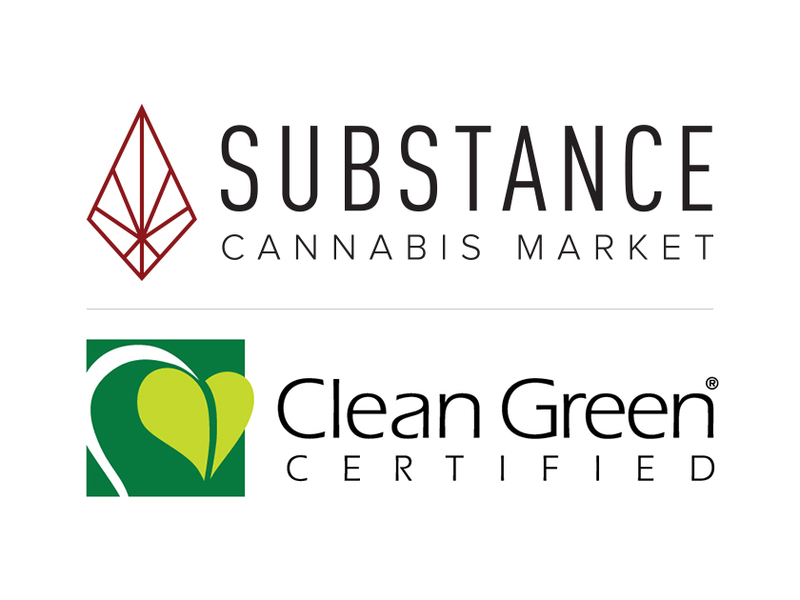 ONLY a certified facility may open and repackage Clean Green cannabis for consumer use. Employees are trained to be able to distinguish between Clean Green Certified cannabis and conventional cannabis. They are trained not to contaminate the product. Facilities, like farms, are required to work on reducing their energy consumption and to improve their reduction each year. Here at Substance we do not take the Clean Green Certified standards lightly. Each day we strive to reduce our carbon footprint, ensure we are purchasing from Clean Green Certified farms and handle the Clean Green cannabis products with the proper care. We are proud to be the first, and one of the only, Clean Green Certified outlets in Central Oregon! To learn more information about the Clean Green Certified program, please visit cleangreencertified.com. 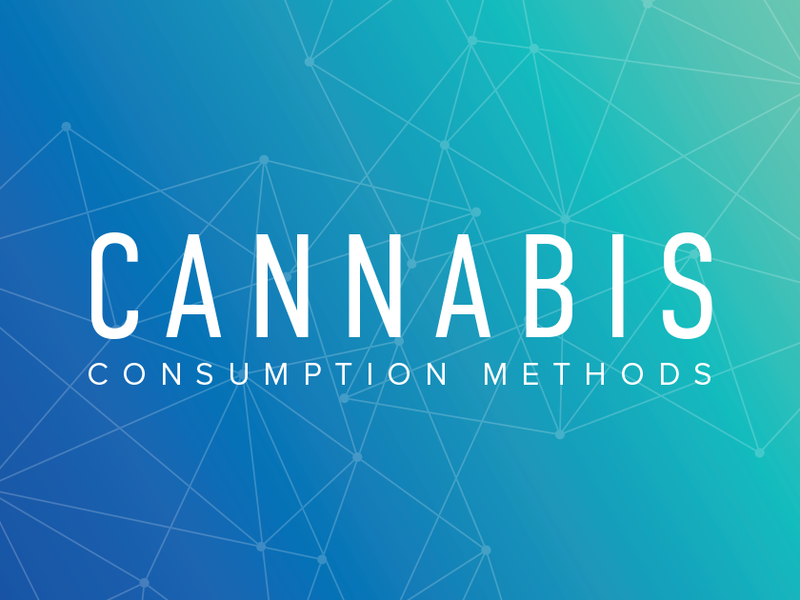 The physical and mental benefits of cannabis greatly depend on how it’s consumed, with each method providing a unique experience with different effects. There are three basic methods: inhalation, oral consumption, and topical application. Each method serves a different unique function and is appropriate for different occasions. Check it out – you might find a new favorite! Inhalation is a common form of consumption that consists of smoking the dry flowers of the cannabis plant. When cannabis is burned and inhaled, smoke enters the lungs and is absorbed into the bloodstream. The brain immediately responds to the cannabinoids entering the bloodstream. For this reason, a person can expect to feel the effects immediately when using this method. There are many ways marijuana can be smoked. It is most commonly smoked in the form of a joint or blunt, or out of a glass pipe or water bong. Cannabis body care products are becoming more common every day. Cannabis salves, balms, roller oils, lotions and creams are all considered topical forms of application. These products are applied directly to the skin and the THC or CBD is absorbed through your pores. Many people enjoy using cannabis topicals for sore muscles, spasms, arthritis, restless leg syndrome, and migraines. Most cannabis body care products do not get you “high” and are non-psychoactive but, we do always recommend starting with small amounts as everyone is affected differently. How is vaporizing different than smoking? Vapor contains a higher percentage of cannabinoids and extracts the therapeutic ingredients of cannabis at a much lower temperature than burning. Many people also find that cannabis lasts longer when vaporized and lessens the adverse effects associated with smoking. There are many different types of vaporizing devices on the market today. 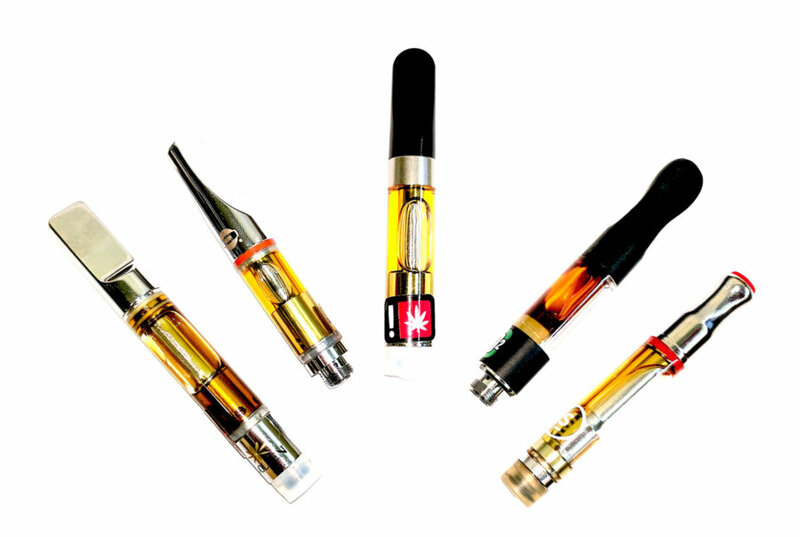 The most common are portable vaporizer pens that can be used to vape oil, flower, or both. There are also table-top vaporizers that use a very small amount of flower to produce vapor that is consumed via an inflated bag, or a tube with a mouth piece. Oral application of cannabis consists of using a cannabis tincture that is applied under the tongue. Tinctures are a highly concentrated, cannabinoid filled product in liquid form and are immediately absorbed into the bloodstream unlike edibles or drinks. Tinctures sold with a dropper are commonly diluted into tea or water, or placed onto food. Tinctures can also be swallowed and digested like an infused product, but often have the consistency of oil and are more effective when applied sublingually. Dabbing is a popular form of consumption that combines elements smoking and vaporizing. Rather than a bowl with flower, dabbing requires a heated surface and cannabis oil. When a person places a ‘dab’ of cannabis extract, such as wax or hash oil, onto the heated surface, the concentrate is quickly melted and vaporized. Dabbing isn’t for everyone as it is highly concentrated and affects the body immediately. People dealing with severe pain or extreme nausea report that dabbing can be one of the best ways to get immediate and effective relief. Cannabis can be infused into butter or oil that is cooked into food, mixed into drinks, or used to make baked goods and candy. Eating or drinking cannabis provides significantly different effects from other delivery methods that immediately enter the bloodstream. Cannabis edibles usually take longer to have a physical effect and provides a longer duration of the therapeutic effects of cannabis. Some edibles can take up to 90 minutes to take effect depending on the individual, so be careful and don’t over do it when trying a new product. 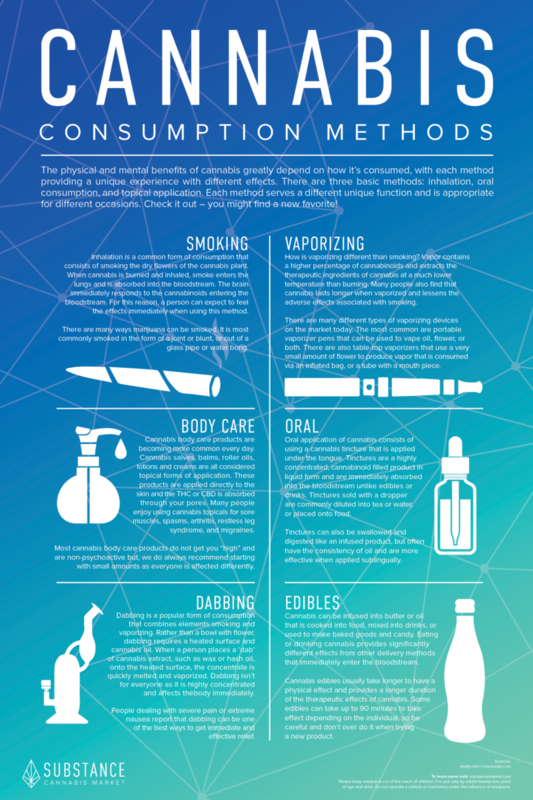 Download the Cannabis Consumption Methods Poster here. Are you new to the state of Oregon? Maybe you’re just passing through or visiting family and you want to stop at a local dispensary. Whatever it is, you probably have some questions regarding recreational cannabis laws. Whatever the reason, you’re in the right place. 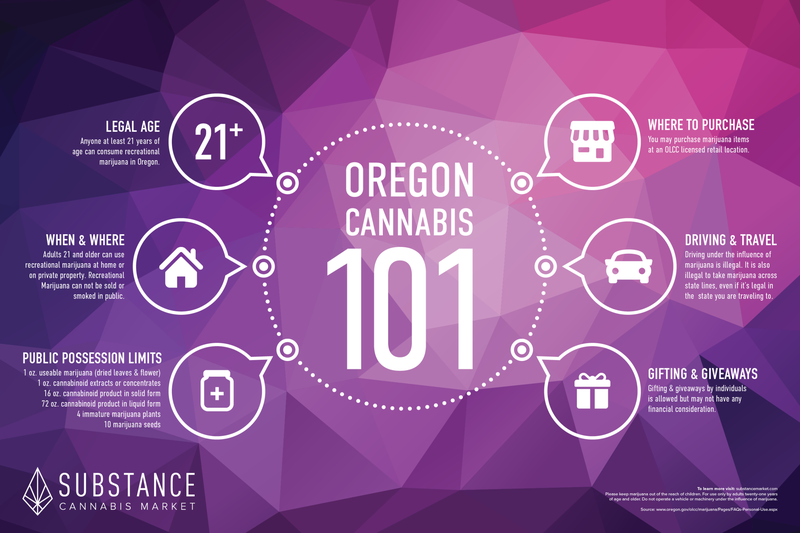 Here is your 101 guide to recreational cannabis in Oregon. If you are 21 years of age and older you can consume recreational marijuana in Oregon. The use or possession of marijuana by anyone under the age of 21 is illegal, including home consumption. Adults 21 and older can use recreational marijuana at home or on private property. You may not smoke or use recreational marijuana in a public place. A public space is “a place to which the general public has access and includes, but is not limited to, hallways, lobbies, and other parts of apartment houses and hotels not constituting rooms or apartments designed for actual residence, and highways, streets, schools, places of amusement, parks, playgrounds and premises used in connection with public passenger transportation.” Also, remember it is at a landlord’s discretion to allow or deny the use of marijuana on their property so, be sure to ask before using it on their property. Private possession limits are the same as public but, you can have up to 8 ounces of usable marijuana at a residence or on private property. Oregonians can grow up to four plants per residence. No, that does not mean four adults can have 16 plants. Four plants per residence, regardless of how many people live there. You can purchase marijuana items at any OLCC licensed retail location, but we prefer you come visit us here at Substance Market or check out our online menu here. Current DUII laws have not changed. That means no driving under the influence of intoxicants (DUII), including impairment from the use of marijuana. You also cannot take marijuana across state lines even if it’s legal in the state you are traveling too. That means you cannot travel to Washington with marijuana even though it’s legal. It is a federal offense. Gifting & giveaways between individuals who are 21 years of age and older is allowed but may not have any financial consideration. Well, enjoy, be safe, and remember to follow the Oregon Cannabis 101 guide and laws for use of cannabis in the state of Oregon. 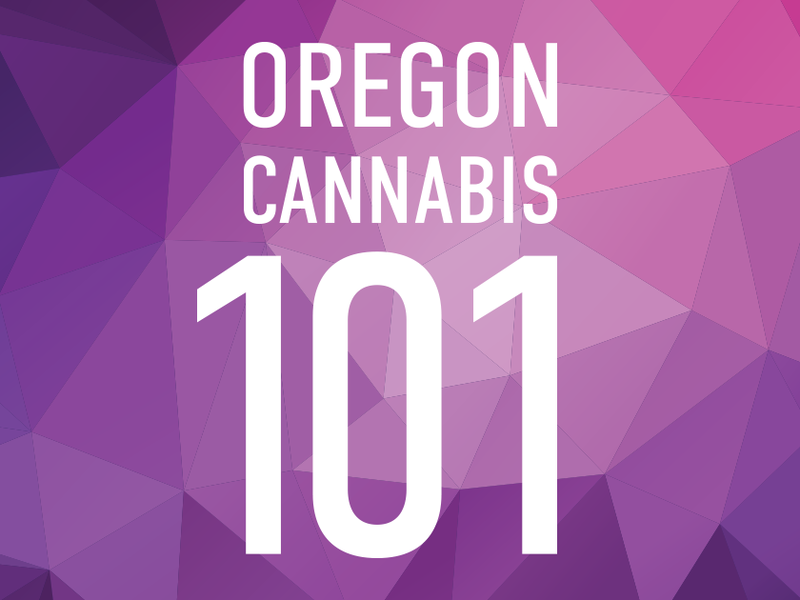 Download the Oregon Cannabis 101 Guide Here or for more information please visit oregon.gov. Our friends at Flower Child wrote this great piece on using cannabis to treat your pets. Their CBD Tincture for Pets is available at both Substance locations. Of course, be sure to consult with a trusted veterinarian before giving medical marijuana to your pet. Marijuana for Pets, Oh My! Our pets mean the world to us, they fill our lives with happiness and laughter, they are loyal and never judge us, they forgive us and are always happy to see us. We love our pets. We want them to be happy and healthy and it’s awful when they are sick. It hurts us to see our pets suffering. Cannabis has been used for thousands of years for it’s therapeutic qualities and as it becomes more and more accepted today for it’s medicinal benefits people are realizing that cannabis works wonders not only for humans but for our four legged friends as well. You got it. Medical marijuana for pets! But, we still have a lot to learn about cannabis in general and marijuana for pets is no different. If you’re considering medical marijuana for pets, here are some important points you want to keep in mind. And of course, be sure to consult with a trusted veterinarian before giving medical marijuana to your pet. Just like humans, animals also have endocannabinoid systems (ECS). The ECS has receptors throughout the whole body. It is this system that helps us maintain balance in our body. If we are deficient in cannabinoids our body is out of whack so to speak. We are unbalanced. Like us, animals produce their own cannabinoids to interact with and signal the ECS. And like us, animals also run into endocannabinoid deficiencies. This is where whole-plant-based cannabis medicine comes into play. Cannabis has cannabinoids which attach to our ECS and create balance and healing for those deficient in cannabinoids. It is almost as if this plant was created specifically to heal and balance our bodies. Be very careful with dosing marijuana to your pet. A marijuana overdose is not fatal, but it can be a traumatic experience as a pet owner. The general rule of thumb is this: give the smallest dose possible and gradually work your way up until you find the smallest yet most effective cannabis dosage level for your pet. But knowing exactly what dosage you’re giving your pet can be tricky, Richter says. And because many of the products on the market are highly potent and animals have a smaller body size, we have to be extra careful. Signs of a pet marijuana overdose. If your pet does experience a cannabis overdose, don’t let the mishap turn you away from this medicine completely. The therapeutic potential is still there if done properly. Too much THC can be extremely unpleasant, and with pets it’s really easy to overdo it if you’re not careful – or if you don’t know what you’re doing. So what does a pet overdose look like, and how do you know when to make a trip to the emergency clinic? If the overdose is substantial enough, the pet’s blood pressure level may not be particularly stable or they won’t eat, Richter says. Even though these overdoses are not fatal they can be an extremely traumatic – not to mention pricey – experience for pets and families. Nobody wants to see their pet in that kind of condition. And the thing with edibles is that the effects can be really long-lasting, 12 hours or longer depending on how much has been consumed. It’s an experience that can turn pet owners away from marijuana for pets completely, even though there is still therapeutic potential if done properly. New research is showing that CBD can counteract the affects of a THC overdose, kind of an antidote. Learn the methods of marijuana delivery for your pet. Deciding which delivery method is best for your pet can take some research. Capsules, treats, tinctures, topicals – just like cannabis medicine for humans, we have a variety of options in delivering marijuana for pets. Richter has seen a lot of pet owners find success with cannabis oils, which they give their pet orally. He has also seen a cannabis topical spray clear up severe skin allergies in dogs, to the point where they stop scratching for 4 to 6 hours. Figuring out THC-CBD ratios for pets. With cannabis there are countless options to form the ultimate combination of strains, cannabinoids, and terpenes. This is an important part of cannabis medicine, especially because the amount of THC, CBD, and other cannabinoids, flavonoids, and terpenes can fluctuate wildly from one strain to another. Dr. Richter has seen success with varying ratios of THC and CBD depending on the condition being treated. “Sometimes, higher concentrations of THC are more effective provided the product is dosed correctly,” he says. Finding the best ratio of marijuana for pets requires experimenting, trial and error – and of course safe access to products that are accurately and precisely labeled. “It is always best to seek the advice of an experienced veterinary professional when deciding which product and what dose to use,” Richter says. Richter advises against CBD products where there is little to no THC – such as with a lot of the CBD hemp oils found online. “If you’re looking to treat a dog that maybe has minor soreness, there might be some positive effect with a hemp-based CBD product, but otherwise you’re severely restricting your therapeutic applications,” he says. “With higher-end therapy for things like cancer, autoimmune disease, seizures, or even severe pain, you want a product that is made from cannabis – not hemp – that has a certain amount of THC in it.” The difference without THC in the mix, Richter says, is like the difference between shooting a bullet and throwing it. Talk to your veterinarian about marijuana for pets. Whether you live in a prohibition state or not, it’s okay to talk to your vet about marijuana for pets. The conversation has to start somewhere, and even if your veterinarian knows next to nothing about cannabis – that’ll change if enough people start asking. At FlowerChild CBD we recommend our CBD Tincture for Pets. 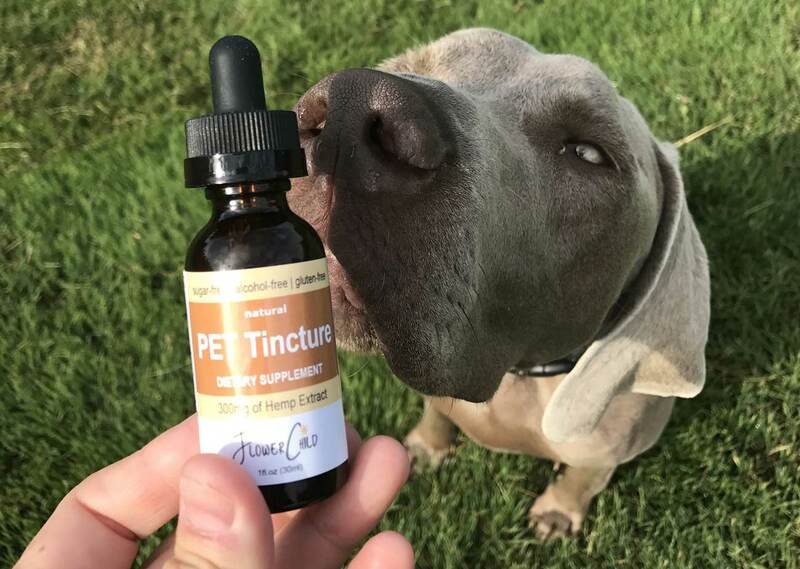 This tincture has been specially formulated for animals with a very high CBD to THC ratio 25:1. It is a medicinal cannabis CBD not a industrial hemp CBD! THC is what gets you high. CBD does not. THC is necessary in the blend to work synergistically with the CBD, but huge amounts of THC are not necessary to receive the medical benefits of the cannabis.